Maybe it’s thanks to the wintry weather still in full force in Germany (though with not so much snow in Regensburg — the #expatweathernetwork indicates the rest of Germany has been getting pounded while we’ve received a mere dusting). Or maybe we just didn’t get enough corn intake while we had the chance. But I’ve been chomping at the bit for some old-fashion savory skillet cornbread. Here’s what I did — with thanks to the Homesick Texan for the inspiration. Preheat oven to 450 °F / 232 °C. Put the drippings or oil in a large (10-inch) cast-iron skillet and place it in the oven for a few minutes until it’s sizzling. Mix together dry ingredients. Set aside. Beat the egg into your beaker of buttermilk. Mix with dry ingredients. Take cast iron skillet out of oven, and pour hot oil into batter, and mix. 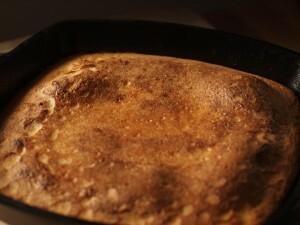 Pour batter into cast iron skillet, bake in oven for 25 minutes. Cornbread should be brown on top and pulling away from the sides of the skillet. There may still be some oil bubbling away on the top of the loaf. If it passes the toothpick test though, it’s done. *Oh no, you live where the Pope is was from and it’s Good Friday and you forgot to buy buttermilk? Don’t fret. Add a tablespoon of plain white vinegar or lemon juice to a cup (237 ml) — minus one tablespoon — of milk. Scale up or down as necessary. Stir it around. It’ll get good and chunky right quick. Now, I’m a-hankerin’ over some cornbread but ain’t equipped. The only cast-iron skillet I’ve got has ribs on the bottom, and I’m not about to surrender three figures of Euros to Le Creuset for a new one. I’ve tried our Pyrex loaf tins…er, they’re not tins, but you know what I mean. They don’t work. Suggestions?BTW, I was listening to the podcast of NPR’s Pop Culture Happy Hour, on the subject of Super Bowl Party Food. They raved over the high-concept Corndog Cupcake. Your fave cornbread recipe poured into a cupcake/muffin tin, with a length of Vienna sausage (“wieners” to the likes of us) baked into it. Pleases the crowd more than buffalo wings, apparently. We checked the Le Creuset selection on cast-iron while we were still in the market. We love our enameled Dutch Oven and (for want of a better term) risotto pan. But I knew a cast iron skillet could be had for less than what they wanted, and besides, theirs is enameled as well. I still feel weird using metal utensils on anything but bare metal. We got this one — paid more than we would have with one purchased in the states, I’m sure, but I’d like to spend the luggage allowance on other stuff. We are quite pleased with its results so far (pan pizza, cornbread, and mundane stuff like frying bacon and eggs). We think it’s ready for something a little fancier and sweeter — stay tuned for more. Oh, and Sarah loves that podcast you mentioned and fully supports the concept of baking hot dog bits into the next batch of cornbread. Yeah, that’s very similar to my recipe. I’d add warmth to it if you have with anything close to Mexican chopped lettuce/sour cream/beans/etc. I use whatever Mexican blend I have left from something else, but Spanish paprika (smoky, warm, not hot) is good too. You can never underestimate the power of the buttermilk in a good corn bread. I use a cast iron skillet at my house, but at other places, a plain old cake pan works just fine. This may seem weird to you, but I don’t think I’ve ever made a more savory cornbread. My grandparents were from Alabama, and moved to Mass, and taught me their honey sweet cornbread. Add that to New Englanders’ love of johnnycakes and I never had cornbread with bacon drippings or anything like that before! Thanks for sharing the recipe, I think I’ll give it a go!